The full-color printed cover is the easiest and most popular cover. It is very popular because of the stunning design techniques and number of colors you can use to immediately capture the reader’s attention. You can choose one of our professionally designed stock covers, or create your own custom cover design! 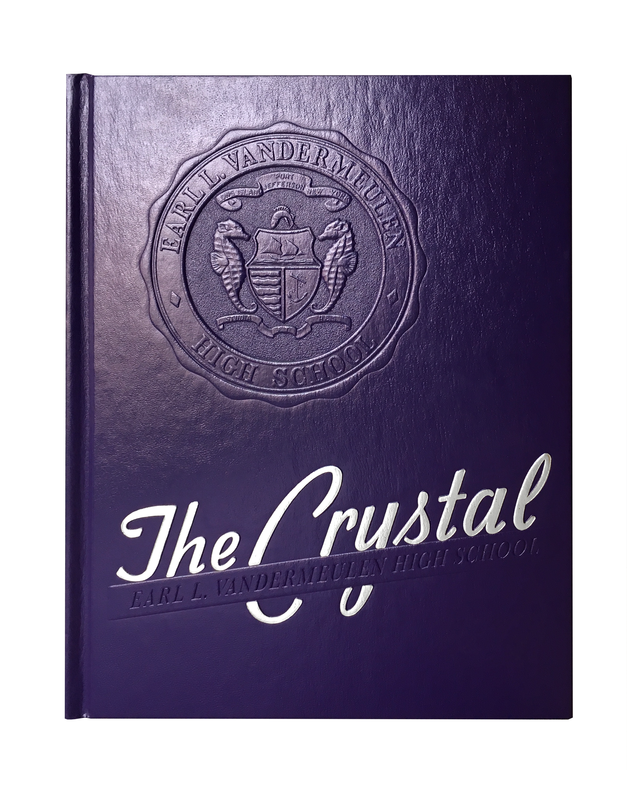 A durable coating is applied to all full color yearbook covers to ensure the colors remain vibrant and the books withstand the test of time. 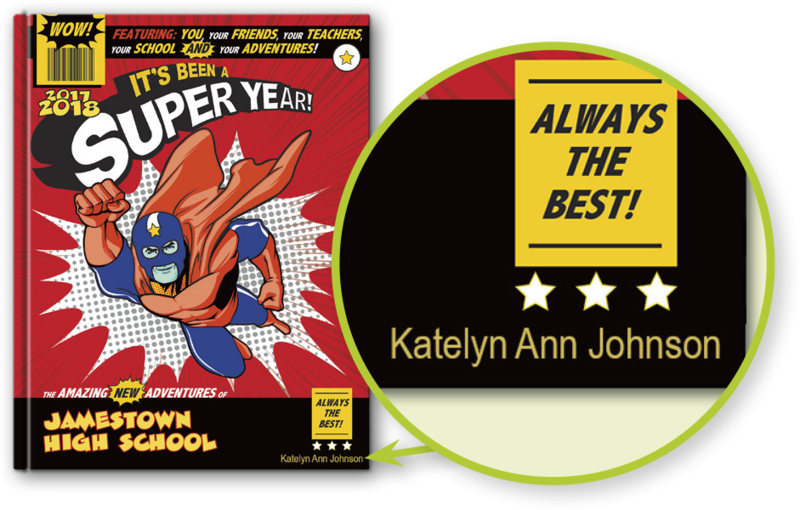 Yearbooks are traditionally printed on a coated glossy paper with a standard 80-lb. paper weight for excellent opacity and durability. Of course, you can always request 100-lb. paper for a more distinctive, durable feel. Standard hard cover binding is typically the least expensive cover binding option, and works well for books with smaller page counts (24 – 220 pages). The signatures of the yearbook are gathered together into a book block and then bound into a hard case. This type of binding is also known as library binding because it is very durable. 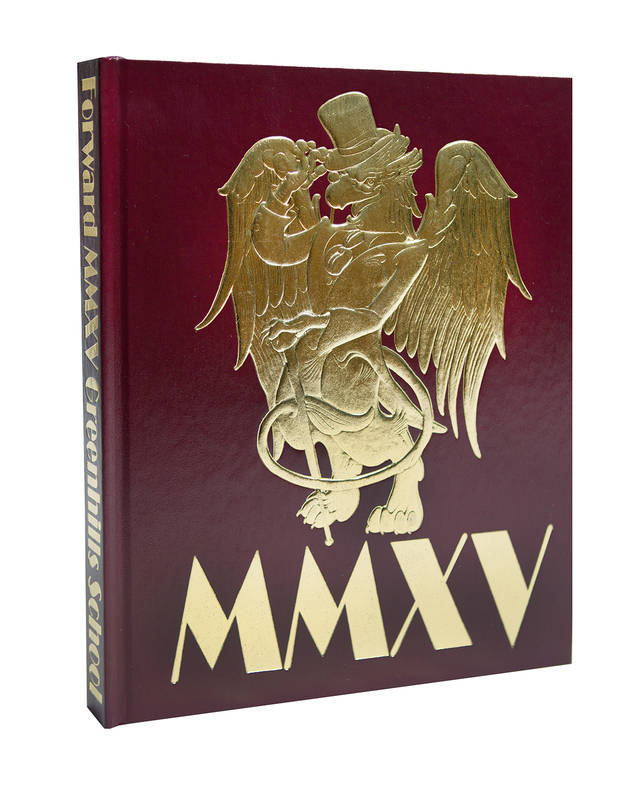 Smyth sewn hard cover binding has the added strength of overlapped stitches, and can be used on books that have 64 or more pages. The advantage of this binding style is that the book will lie flat when open. Typically, you’ll see this binding style in reference books such as medical books, law books, etc. Binder’s board is the most common material used to make book covers. The heavier the board weight, the stiffer the cover will be when trying to bend it. Our standard cover weight is 90 pt. Heavier, 120-pt. and 160-pt. board weights are also available upon request. Leatherette covers are made of synthetic materials that are made to look like leather, but are much more durable. 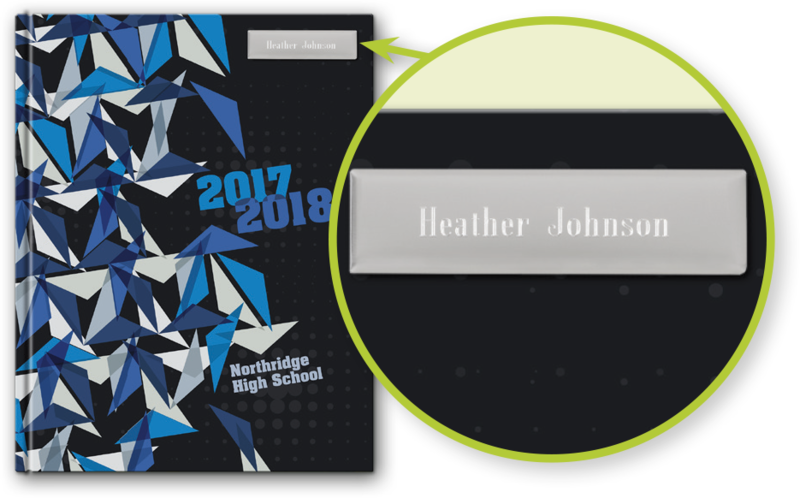 Typically, leatherette yearbooks use foil stamping, embossing and/or debossing to accentuate the school name and cover design. 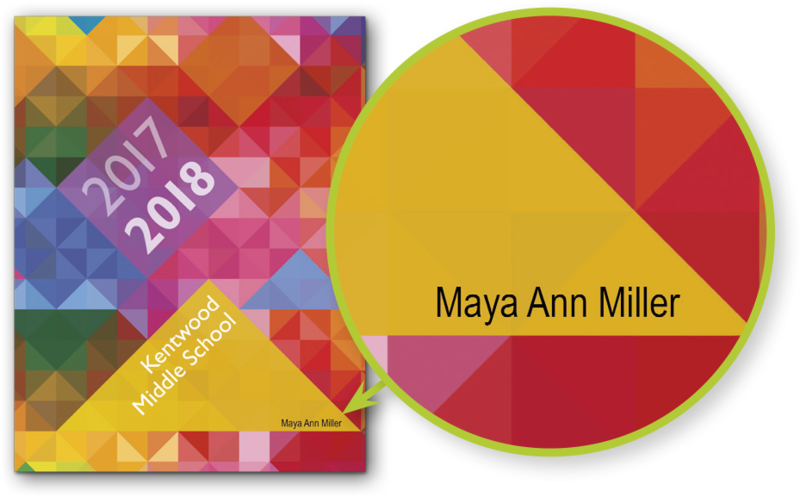 Choose from this generous selection of leatherette colors below to make a great first impression of your yearbook! Endsheets are the thick paper attached to both the inside front and back covers of a hardcover yearbook next to the flyleaf (first and last sheets in a book before and after the book content). The quality of the paper is usually different than what is used in the rest of your yearbook. Listed below are colors available to you. The dies featured below are available for embossing/debossing and/or foil on your custom cover. By choosing one die or more, you can create a one-of-a-kind look without the expense that often accompanies it. 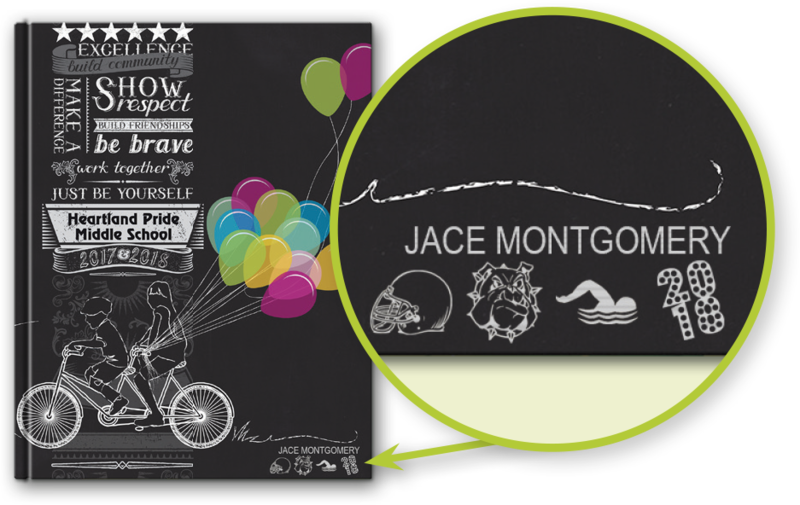 For example: Choose a stock die for embossing and then add a custom die of your school name and mascot to make your book truly unique. Due to the endless design possibilities available, pricing will vary. Embossing is a technique which creates a raised, or 3D, image on a piece of paper. It is typically accomplished with a combination of heat and pressure on the paper. 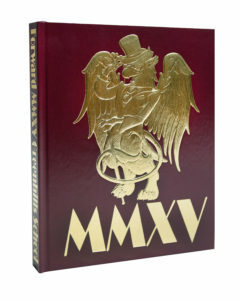 Embossing can also be used with foil stamping or on a full-color cover to create an even more unique look. Debossing uses the same technique as embossing, except the impression is heat-pressed into the surface of the paper so that an image is depressed (lowered) instead of raised. As with embossing, debossing can be used with foil stamping or on a full-color cover to create special visual effects and textures. Foil stamping involves the use of heat to transfer metallic foil to a solid surface such as a yearbook cover. As with embossing and debossing, a die is needed to “stamp” the foil into the cover material. Foil stamping can be combined with embossing or debossing to create a very striking 3D image. While gold and silver metallic foil never go out of style, the additional colors shown are popular as well—choose colors that give your book a one of a kind look! 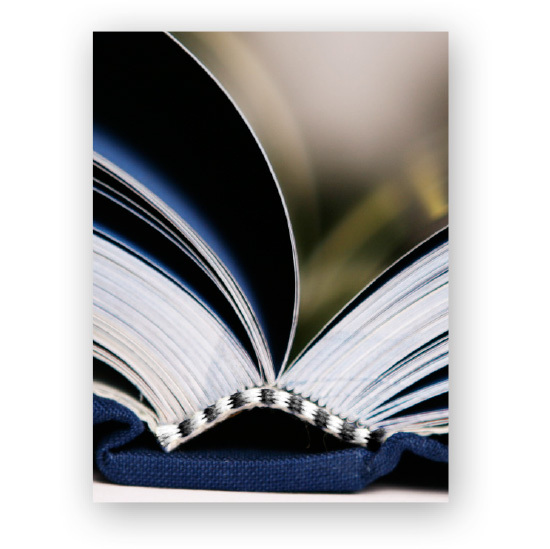 Head and foot bands are included on Smyth sewn books and can be requested on standard hard cover books. These small ornamental bands, generally made of silk or cotton, are attached to the top and bottom of a hard cover book block. 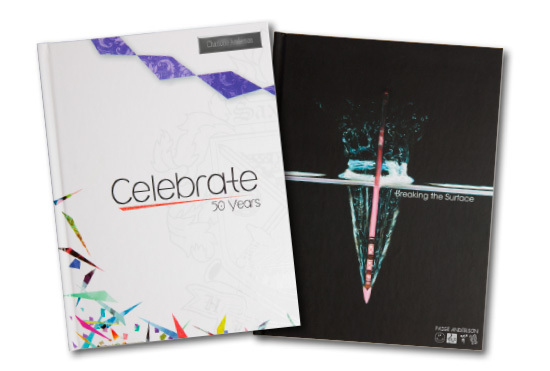 They serve as a decorative way to hide the binding application or stitching on the spine of a yearbook. They come in a variety of solid and “striped” colors. Lenticular printing is used to produce printed images with an illusion of depth, or the ability to change or move as the image is viewed from different angles. You can create various frames of animation for a motion effect, show a set of alternate images or make an image appear 3D for a truly interactive experience! A die is a specialized tool that cuts specific shapes into your yearbook cover. Die-cutting allows you to cut out specific areas or shapes on your cover, allowing text or part of an image to show through from the inside. Spot UV is a great treatment to use if there are specific areas (or spots) on your cover that you would like to highlight. The application can deepen the color of the area and be very shiny or flattened to a matte finish. It’s a great way to add eye-catching emphasis to important areas. Personal messages are always an important part of the yearbook! Choose from three professionally designed styles printed on uncoated paper to make writing easier. Four-page and eight-page sets available. 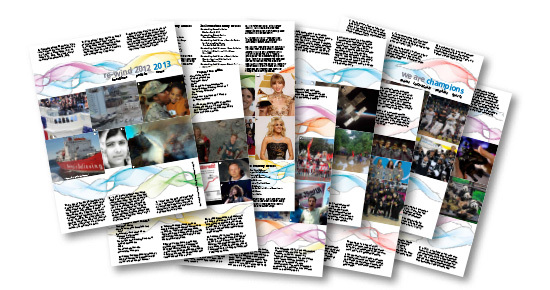 Current Events Pages are available for FREE as backgrounds and clip art in Pictavo. Choose the ones appropriate for your school or age level and simply drag and drop onto any page. Just make sure to include them in the total page count as they are treated like any other pages in the book. Current Events will be available in February 2019. 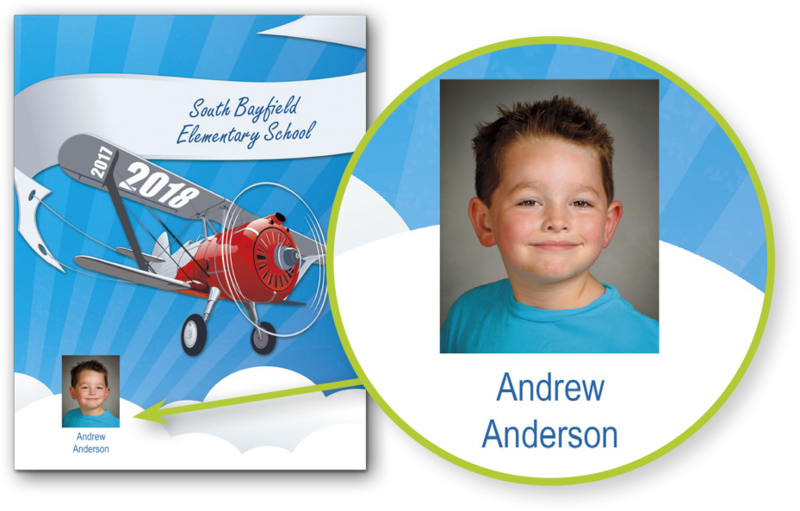 Check out the personalization options that enable students to include their name, photo and/or personal interest icons on their cover. Talk about one-of-a-kind! Ask your yearbook coordinator for more details. Choose from 5 personalization options!